From tapping your foot to bobbing your head to launching yourself into an all-out Lindy Hop, swing music simply makes you want to move. When it involves 17 musicians and originates with Count Basie, the dance formula is pretty much guaranteed. Hailing from Denver, H2 Big Band’s two albums have reached top 15 status on Jazz Week’s national play list and the band’s original target was set on the studio. Then they realized how exhilarating it was to perform, which they will do in Vail on Aug. 25, paying tribute to Count Basie. In addition to Hanson and co-leader/trumpet player Al Hood, the band features a rotating line-up of 15 acclaimed artists, including a massive brass section, which it turns out is pivotal to the Basie sound. The explosive performance will cover Count Basie tunes from the 1940s through the 1970s as well as a handful of H2’s original compositions. Without seeing the Count in the flesh, die hard Basie fans with their eyes closed will be hard-pressed to distinguish H2 Big Band from the swing king’s original band, the sound is that authentic … not to mention infectious. Each member of the big band is faced with a complex task of timing, harmony and connecting with the audience, but for Hanson, who plays the role of Basie, nailing the formula is especially involved. 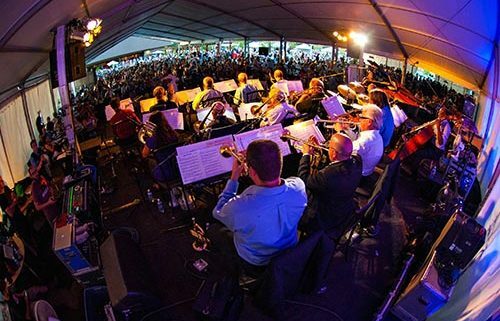 The broad gamut of Basie’s sound including many of the Count’s classic arrangers will be summoned by H2 big band during the Vail performance. Even for audiences not familiar with Basie’s legacy, the urge to dance will be undeniable. Hanson says that every live H2 Big Band performance is characterized by one fixed reality above all others and that’s to expect the unexpected … especially when Count Basie is the theme. Catch the H2 Big Band Tribute to Count Basie at Vail Jazz @ Vail Square from 6 to 8 p.m. Aug. 25 inside the all-weather jazz tent in Lionshead. General admission tickets are $20 in advance and premium seating is $40 in advance. For tickets or more information, visit vailjazz.org or call 888-VAIL-JAM.